2018-03-17: A baby elephant was born on March 17th...The baby elephant was given the name “Samson”. 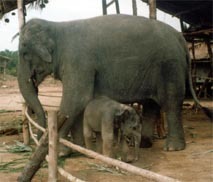 He was born to the mother elephant named “Phang Radsamee” and the father named “Numsek”. The mother carried the baby for a total of 24 months before Samson decided to appear at approximately 11:00 p.m. on 17 March.